Best Natural Face Pack for Oily Skin. This is the best natural face pack for oily skin and has only two ingredients but trust me it’s super effective!!!! I’ve been facing the ugly effects of having an oily skin since I was a teenager! That cake-y, sweaty, oily skin -ew! I just hate it! But finally one of my best friends suggested me this amazingly effective face pack which keeps the oil away for days –and the great part is it’s totally natural and pocket friendly! Take one and half tablespoons of multani mitti in a bowl and mix rosewater to it such that a thick paste is formed.Apply the paste evenly to your face and wait for 15-20 minutes. Do not apply the paste on and around your eyes..
Do not apply on your lips. Do not smile or talk or make faces after you put the face pack on, it will cause your skin to stretch which is not good. Tie back your hair before you start. Multani mitti is really helpful to fight oily skin. These face packs are completely natural so there are no chances of side effects. Multani mitti removes the dead cells from your skin and allows it to breathe. On regular use, acne and pimples disappear. It helps reduce tan and gives you a fairer glowing skin.Its smells really good. It’s so far been the best natural face pack for oily skin, at least for me.. This my favorite face scrub for oily skin have helped a lot to keep my skin glowing and oil free! If these ingredients are not available, you can buy Ujala herbals aleovera clay pack..
Do you know of any other face packs for oily skin? 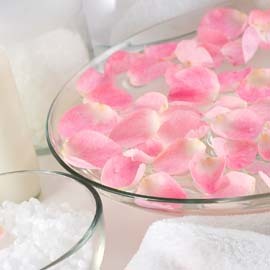 5 ways to use Rosewater! Best Natural Face Scrub For Oily Skin. Make Flavoured Lip Scrub at home! 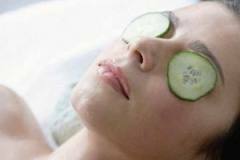 11 Tips to Get Rid of Dark Circles at Home. 8 Comments on Best Natural Face Pack for Oily Skin. Using blotting papers for men is also a nice way to get rid of your oil in public 😉 have you tried them? Hey vidhi, I tried this facepack yesterday…it worked wonderfully..though my skin felt a little dry few hours later..is there something i did wrong? OMG what a disaster, I couldn’t find the Multani Mitti so used dirt from my garden. Im still getting rid of it. This morning I woke to find a worm on my pillow! Multani mitti is Fullers earth..It smells really great and is not same as your gardens soil.. Sorry that happened to you..
Sure i would love to try these..where exactly will i find these citrus clear products you mentioned? Loreal Paris Color Riche So Chic Pink Review and Swatches. India Circus Casual Bag Review. My shopping experience: Myntra Review. Tanya on Remove Glitter Nail Polish Easily! Vidhi on My Shopping Experience: Flipkart Review. Ankur Manju on My Shopping Experience: Flipkart Review. littlemisssulley on My shopping experience: Myntra Review. AIK YIN CHIEN . on My Shopping experience: Born Pretty Store Review.